I know you are all probably sick and tired of the election. There has been so much ugliness. I try to stay away from political posts because this is my place of comfort and happiness. So while I am not happy about the election results and I admit it took me quite a long time to fall asleep last night, I just have to hope that people remember to have some compassion for one another. 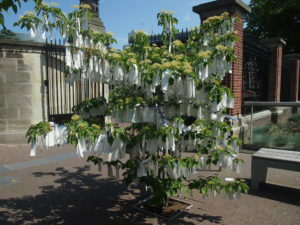 So I leave you with this picture from the Peace Palace in The Hague (this is the peace tree where people can hang their wishes) and a quote which I think is lovely and tomorrow I promise to get back to the book talk. Love the Rumi quote. I’ve tried to avoid much of the ugliness associated with this election, and I will say that–for the most part–friends and family who feel differently have been circumspect in their comments, both before and after. After so much ugliness, it will be hard for some people to reconcile even with long-time friends. Love the idea of a peace tree. We could benefit from a forest of them right about now.